Well i have been after a gobbler turkey for the last 2 years, this is my 3rd. Not killed yet but have been close a couple times. 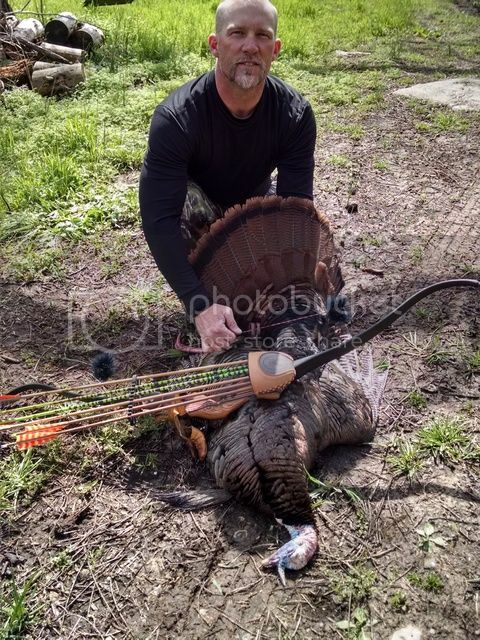 Well here is my good buddy luther who went out the first time with his recurve and done a spot and stalk on this fine gobbler. It was about 21 pounds 10.5 inch beard and 1 1-8 spurs... I think he may be invisible in the woods? or just plain L U C K Y!! Nice, very challenging to do. Awesome! I've been trying it with a stick bow, off and on, for 3 seasons now. I usually end up giving in and taking a shotgun to get a few for the freezer.